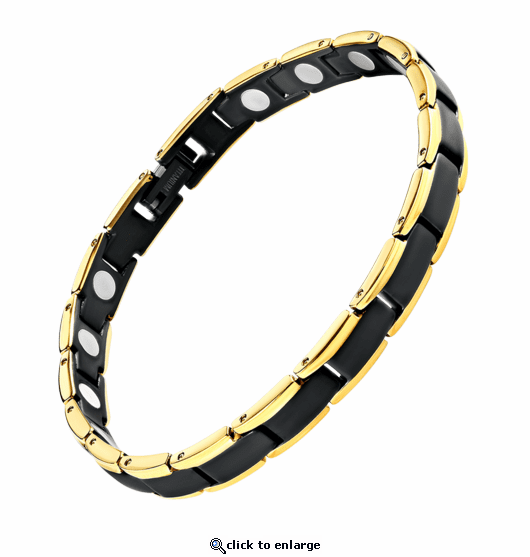 This stunning slender black titanium magnetic therapy bracelet is styled with shiny 18k gold stripes. Lightweight & durable, this bracelet is about 1/4" wide and has a powerful & permanent 3300 gauss neodymium rare earth bio north facing magnets in each link. Order yours today. Love my bracelet, I choose the black and gold petite magnetic bracelet, many compliments. I will be purchasing another in the near future....different look just to switch it up. Also thinking about an anklet. The owners are very nice to work with. I purchased the Black & Gold Magnetic Titanium bracelet and I am extremely happy with it. This bracelet has class written all over it and I have received several complimentary comments.